And it's with a lot of pleasure that I tell you about my first delivery in my dearest Putney - London! I meet the very friendly Joan at Matteo Delicatessen yesterday and gave him a few samples of some of my cakes! And TODAY I have two cakes selling there! I am so happy and so proud that I have something I made selling there! It's very exciting! 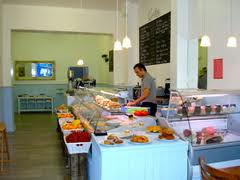 If you want to try a slice of my cake, then go to Matteo Delicatessen, Upper richmond road - near putney's train station. Check here for a look at Matteo's Delicatessen. Go check Matteo out, try some of their amazing italian food as well as my apple and cinnamon cake and my very chocolatey brownies! yay!